On November 7, 1805, Lewis and Clark were on the finishing few miles of their incredible journey across 2/3 of our own United States; they had reached what Clark thought was the Pacific Ocean and in his journal he wrote, “Ocian in view! O! the Joy”. What Clark didn’t know was that they had actually arrived at the estuary of the Columbia River and were still 20 long and very tiring miles from their ultimate destination of the Pacific! Such was the case this past Memorial Day as Frank and I, along with my dad (aka, the drop off man) traveled north about an hour and a half to Sugar Creek to both float the creek and fish for trophy smallmouth. 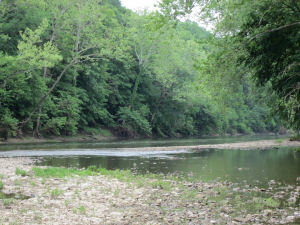 We had arrived at about 9am at a new DNR access point onto Sugar Creek about 15 miles southwest of Crawfordsville. Neither I nor Frank had ever been on the creek before and I had surveyed several maps of the area…however, knowing how long it would take for us to travel the 7 water miles downstream to the Deers Mill Covered Bridge pick up point was the big question! We both had our new Voyager inflatable pontoon boats and were eager to see the inner beauty of Sugar Creek. As we pushed away, leaving dad there on the shore, a Golden Eagle launched from atop a tree and gave us an insight to much more wildlife to come. On the day we watched several Bald Eagles, Herons, Cardinals, Belted Kingfishers, ducks, geese and a variety of songbirds. Our Voyagers worked perfectly and allowed us to float through the rapids, then fish the long runs and slower areas of the creek. Things started very slowly and for the first hour or so…Frank was the only one to hook up with anything, he caught a couple of 12 inch smallies…and I was glad to see it as I wasn’t sure what was going on? I switched from a crayfish pattern to a shiner imitation that had worked earlier in the week and within a few casts I had my first catch of the day. The next hour or so…was why I put so much time into-and love fly-fishing so! Not only was I in one of the most beautiful streams I have ever seen…I was fishing with one of my good buddies and catching one smallmouth after another. I was walking down the left hand portion of the stream as Sugar Creek is way too wide to fish both edges…and started to notice that there was about a 10 foot trough that was spewed with boulders that had fell from the very steep cliffs on either side. The fish were waiting in this area for an unsuspecting baitfish to wander into their lair…and then they would pounce like predatory fish do. At one point there was a large Sycamore that had fell into the stream and provided what looked like picturesque smallmouth cover; I made a 45 degree cast and allowed my shiner pattern to drift parallel to the main beam of the big tree, bang, a great take and a nice 14 inch smallmouth was brought to hand. 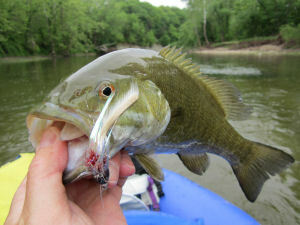 I made yet another swing of the fly through the exact same water and this time I knew I had struck gold…there in the crystal clear water was an emerald colored smallmouth and it was none too happy to have been hooked. The current was quite strong and when combined with a brute of a fish…let’s just say that it stressed my 5 weight TQR rod. Patience prevailed and a few minutes later I snapped the shot above of a gorgeous 17 inch smallie! I looked at my watch and it was 12:30pm and casually said to Frank that the worst part is just not knowing how much more river we still had to go (knowing we were to meet dad at 1pm?). I jumped into the Voyager and rowed backwards around the corner and there before me was a bridge over the creek…yeah! Right on time…and then something internal told me that this wasn’t the correct bridge. As we neared the overhead structure it was clear that we were not at our pick up point and I looked at Frank and we both decided we had better boogie down the stream as it was now 1:05pm. I knew that dad wouldn’t panic but at the same time didn’t want him to have to wait for an insufferable amount of time. In my mind I started to calculate how far had we gone? How fast were we now moving…going with the current and paddling quite quickly? Then it hit me…it didn’t matter…we just needed to row and enjoy the day, it would all work out. I must say that around each bend I was anticipating seeing the covered bridge and a red Suburban…but one curve after another ended up with nothing. Finally we came across an older gent picking up sticks along the shore and he informed us that we were still about a mile and half away (about 45 minutes). OK…so, now we know and down river we went. Then at last…O! the joy! One final bend and there before us were both bridges and a red Suburban and being the Lewis and Clark fan I am I yelled back to Frank, “Oh, the joy”! Humorously Frank replied with a fist pump. As we eased into the takeout point dad looked up calmly…and in his own steady demeanor asked, “How was the fishing”? All I really wanted was to be out of my hot waders with a cold bottle of water…and it sure did taste good! If you haven’t yet experienced Sugar Creek…please do yourself a favor and make the journey north. I have been fortunate enough to have been on a number of grand waterways and Sugar Creek is as good, heck…its better, than any of the others! There might be no better place in Indiana to Enjoy the Great Outdoors.